Although the stories are difficult to read, each leaves the reader with an understanding and some sympathy for the characters’ circumstances, and possibly a sense of shadenfraude. Hamid focuses on the lives of two immigrants, Saeed and Nadia, whose country is bombarded by war and terror. Saeed, the son of a university professor, works at an ad agency and lives with his family. Nadia lives alone, rides a motorcycle, and wears a full black robe, not for religious deference but to discourage men’s interest in her. Opposites attract; they meet in a college class on product branding and fall in love. As the city becomes overrun with refugees and the terror escalates, many yearn to escape. Hamid graphically documents what is it like to live in a war zone and the desperate lives of those who are collateral damage. The novel veers into magical realism when Hamid creates mysterious doors opening to other places. Unlike the wardrobe in C.S. Lewis’s Chronicle of Narnia, these portals lead to actual places – in this case, first to the island of Mykonos, then to the outskirts of London, and finally to San Francisco. As Saeed and Nadia escape through each set of doors, they find themselves among other refugees and subsist poorly. Their lives are difficult, facing constant fear and roadblocks. Hamid electrifies the refugee crisis as he melds the political and personal, and disconcertedly jumps between scenes of bombing and drones to starry skies and dreams of a future. The novel ends with hope, but also emphasizes how experiences have affected the couple – even magical doors take a toll. The story is difficult to read, not just for the misery and struggle but also for its truthful timeliness. When I read Mark Binelli’s interview of Gerald Murnane in the Sunday New York Times – Is the Next Nobel Laureate in Literature Tending Bar in a Dusty Australian Town? – my curiosity led me to Binelli’s recommendation for a place to start reading the author – his collection of short fiction, Stream System. An obscure Australian writer, Murnane lives in a poor ramshackle space outside of Melbourne and would seem more eccentric than brilliant. He prides himself on writing only what he knows within his small sphere – no travel and little patience with people. His stories are set near Melbourne, are in part autobiographical, and focus on perceptions. The canon of his work is extensive and his writing reflects a strange simplicity reminiscent of Hemingway. The first story in his collection – “When the Mice Failed to Arrive” – jumps from introspection to problem-solving and left me not with a yearning for more but with a general unease. You can read it – here – and decide for yourself. McEwan’s stories are always compelling but with sad endings. Although I have read many of McEwan’s books (Atonement, On Chesil Beach, Sweet Tooth, Nutshell) I had not read this earlier work – The Child in Time. More for the actor Benedict Cumberbatch than for the story, I watched the PBS Masterpiece production. The story shows Stephen, an author of children’s books, and his wife, as they deal with the kidnapping of their three-year-old daughter Kate. A sense of magic as well as despair pervades their grief as Stephen has glimpses of his daughter after her abduction. The ending offers a sense of hope but their overwhelming pain persists. The drama was compelling and worth seeing. The story will stay with me, but I doubt I will read the book – enough. Although Andrew Wyeth’s famous painting of the woman crawling through the field to a house in the distance has long evoked a sense of mystery, Christina Baker Kline attempts to explain the life of Christina Olson in her novel – A Piece of the World. The woman crawling through the grass in the famous painting “Christina’s World” was Andrew Wyeth’s neighbor in Maine. In discussing this work, Wyeth explained, “The challenge to me was to do justice to her extraordinary conquest of a life which most people would consider hopeless…she was limited physically but by no means spiritually.” The image suggests a story, and Kline fills in the unknown details of Christina’s insular life, and her role as muse to a great artist. Although Christina suffered from a progressive crippling disease, she refused treatment or leg braces, crawling along the ground to get from place to place, amazingly without self-pity or the pity of most who knew her well. Kline fills in the background of her childhood and creates an ill-fated romance doomed by her disability and her poverty before meeting Andrew Wyeth in her forties. Living without electricity or indoor plumbing, and kept from school by her father to work the farm, Christina continued in the dilapidated house that eventually became Wyeth’s studio. Although Christina Olson is the focus of the story, the painter, Andrew Wyeth comes to life just as convincingly. Kline connects the painter to his subject by comparing their childhoods and their outlook, and offers to fill in the blanks of their relationship. Wyeth sees beyond the rundown house and the austere restricted lives of its tenants, Christina and her brother, and produces a portrait of longing and determination not unlike his own. At times the narrative can be as slow as the lives of the characters, perhaps reflecting the stillness of the Maine landscape, and I found myself skipping over some of the protracted dialogue. Almost like staring at the painting, reading the novel requires a patient eye to reveal more than what is obvious. Kline summarized her research in her “Author’s Notes” at the end of the novel, and it would be wise to read both her notes and her Acknowledgments first before the novel. Her extensive reading on the lives of both the Wyeth family and Christina Olson provides a number of references worth noting, and her short summary adds meaning to how she embellished their lives in her fiction. Her description of her own young life living with her parents in a thirteenth century Cambridge cottage without central heating and on an abandoned Tennessee farm, connects her to her subject. But, the best part is the color print of Wyeth’s painting on the last page. Start from the back of the book and then begin Kline’s story. Don’t be fooled. Just because there’s cake in the title, Aimee Bender’s The Particular Sadness of Lemon Cake is neither tasty nor satisfying. But it does have a bittersweet freshness that draws you in and makes you want to gobble up the whole book in one setting. The dysfunctional Edelstein family has the stereotypical suburban parents, with a mother yearning for something more in her life (familiar sounding theme? ), and a father who overworks and is almost uncommunicative. Rose is the star of the action, with her unrealistic magical talent for perceiving the emotions of whoever makes the food, from her mother’s unhappiness stirred into her lemon birthday cake to the disgruntled orange picker ‘s influence on the juice. Do you remember Like Water for Chocolate? 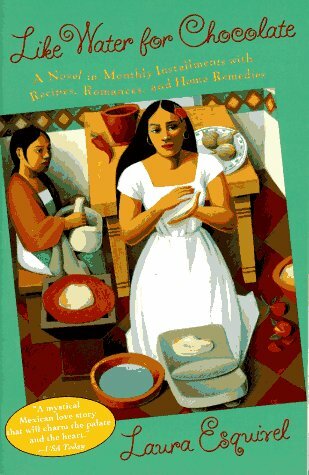 In Esquivel’s book, the cook stirs her emotions into the pot. In Bender’s book, Rose can taste those emotions, as well as the source of each ingredient – the anger of the laborer who picked the parsley or the bitterness of the factory workers who packaged the cereal. Desserts are especially ripe for interpretation of the baker’s emotions – cookies and cakes become sources of despair as Rose finds out more than she wants to know – maybe more than she should know. Rose’s brother,Joseph, nicely completes the family circle as a young science prodigy who grows up to be the typical morose teenager. Life almost seems pastoral, until suddenly Bender takes you into the twilight zone. Joseph doesn’t seem to be able to demonstrate his potential and his college applications are denied. At first, he seems to be the misunderstood genius, working on his own mathematical equations to improve the universe – until he disappears. How he disappears takes the story into science fiction or fantasy land, but his first disappearance will compel you to want to know more – how, where, why. By the end of the novel, Bender will answer your questions – literally, figuratively, metaphysically. Bender could be making a statement about family life, about how it’s impossible to understand other people’s issues, or maybe about how a young girl grows into her talents. Maybe that’s a clue, or, as Robert Frost says, sometimes a poem is just a poem –or in this case, a story just a story – not sure what kind of taste it will leave you with – certainly not one you expect.